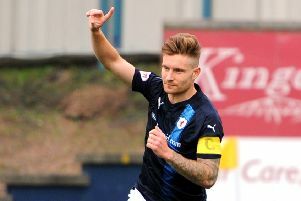 Kyle Benedictus is hoping to win promotion with Raith Rovers so manager Ray McKinnon will finally forgive him for knocking his Brechin City side out of the play-offs. The big defender scored a stoppage time header in the relegation play-off semi-final at Glebe Park last season to help former side Alloa to a 2-0 first leg victory. It proved to be the decisive goal in the tie as McKinnon’s Brechin fought back to win the second leg 1-0 at the Indodrill Stadium, but went out on aggregate. Alloa went on to salvage their place in the Championship with victory over Forfar in the final, with Benedictus on the scoresheet again, and he is hoping he can do likewise for Raith. “The manager has mentioned it a couple of times!” he said. “But I think he will finally forgive me if I can score a couple on Wednesday or Saturday. “We beat Hibs the last time we played them and drew with Falkirk last week but to be honest, the boys weren’t bothered who we played. “We didn’t even look at their scores until the end of the Livingston game to see who we got. We were happy to take either of them. “There is no pressure on us and if we can play the way we have been playing, then we’ve got every chance of going through. “Even the games we have been beaten by them (Hibs) this season, it is only been by the odd goal. We have always been in the game and it has maybe been the odd mistake that has cost us. Benedictus was due to return from suspension for the play-off first leg against Hibs tonight (7.45 p.m) after missing the 1-0 win away to Livingston on Saturday. “I was at the game supporting the boys,” he said. “We are 11 games unbeaten with just one defeat in the last 15 which is incredible. Benedictus was part of the Dundee side that went on a 23 game unbeaten run in 2010-11 after a 25 point deduction for entering administration. He sees similarities in the current Raith squad. “When I was at Dundee, you had guys like Rab Douglas and Gary Harkins who were all big characters and it is the same at Raith,” he said. “Jason Thomson is a big influence, Craig Barr has come back and he is a strong lad. If you take a telling off him, you listen as he is a big boy. “Lewis Toshney is another big character, I also like to shout now and again while Kevin Cuthbert in goals is always talking to the back four.